Reno, NV (July 19, 2010)—Laura Leigh, Herd Watch Project Coordinator for The Cloud Foundation, has been denied access to observe the Owyhee roundup, the first leg of the Tuscarora roundup near Elko, Nevada. On July 16th, Federal Judge Larry Hicks’ ruled Leigh’s First Amendment rights be upheld and therefore allow her and others to view the roundup. Leigh contends that the BLM has gone against the Judge’s orders for three days. Today Leigh filed a motion to uphold the court order for her First Amendment rights. BLM officials refused to tell her where the trap site was located. They had strategically placed it on private land within the public herd management area (HMA) even though the range contains more than 450,000 acres of public land. The private landowner would not grant Leigh and others access. BLM used this method before to hide the Calico roundup from the public and journalists except for rare staged “media days”. The helicopter stampede resumed as soon as the Judge lifted the injunction last Friday. Since then BLM has captured 620 mustangs and their young foals in the sweltering heat. More than 17 wild horses have been killed during the roundup. At least 2 foals were shot (euthanized) because of leg deformities resulting in lameness after being run over many miles of volcanic rock. Advocates question the accuracy of the diagnosis—pointing to evidence that lameness previously was caused by running the hoofs off the baby horses during last winter’s Calico roundup in Nevada also run by Cattoor Livestock, the private contractor who will be paid close to one million dollars for this roundup. The BLM has created an alleged wild horses dehydration emergency by fencing mustangs off from water and running them scared by helicopter into traps. Advocates feel it is inhumane that the BLM is not treating the wild horses in the wild for dehydration but instead the BLM continues to chase them, round them up and ship the wild horses crammed in huge trucks for more than 5 hours to a temporary holding facility—all in the desert heat. Leigh had filed a Temporary Restraining Order (TRO) to stop this roundup and defend the public’s first amendment rights to observe the operation. BLM testified in federal court that no cattle remained on the range and that the horses had no water—even though a river is only 10 miles away, a short distance to travel for wild horses who under normal circumstances may travel twice that distance in daily treks to get a drink. 4,000 privately-owned cattle are permitted to graze (and drink) on the Tuscarora Complex where BLM permits only 400 mustangs. Made up by three separate HMAs: Owyhee, Little Humboldt and Rock Creek, the area is to be managed by BLM principally (though not exclusively) for the federally protected wild horses. The foundation wants to know what is stopping the horses from accessing the Owyhee River and other perennial water sources? Are gates locked and vast areas fenced for livestock in the HMA? The three Tuscarora roundups (Owyhee, Little Humbolt and Rock Creek) were scheduled months ago as a standard BLM operation. The wild horses were found to be healthy. The primary reason for the roundups was because the wild horses were allegedly damaging livestock fencing. The public, mustang advocates, animal welfare groups and equine experts warned against summer helicopter roundups in the desert heat. The BLM ignored the comments. 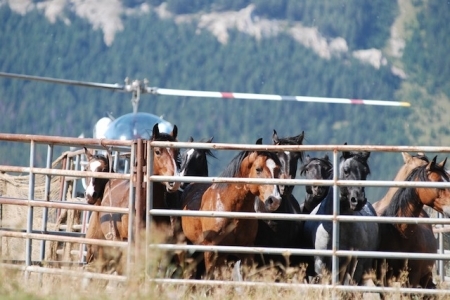 The Cloud Foundation calls for immediate access to be given to all members of the interested public and for the addition of at least two knowledgeable wild horse advocates to BLM’s assembled team of insiders to determine what went wrong in the Owyhee disaster.